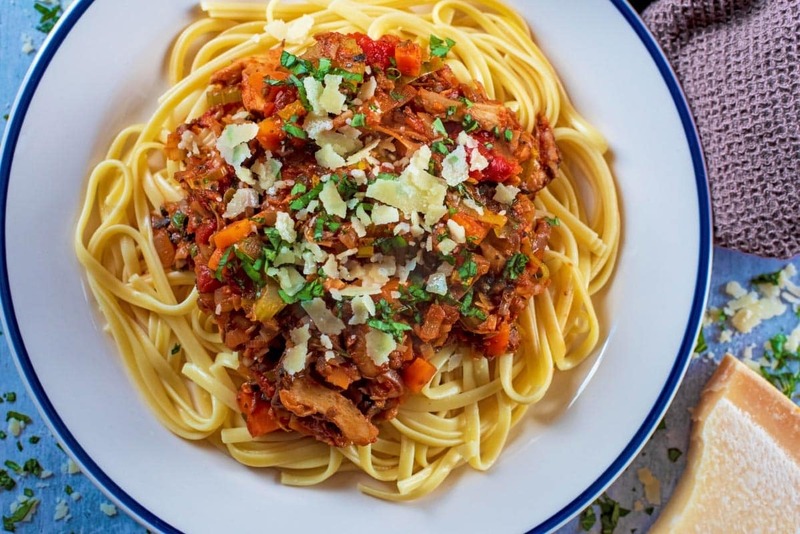 Spaghetti Bolognese is always a family favourite, but this version uses just mushrooms instead of beef to make a vegetarian (it can even be vegan) version of a classic Italian dish. 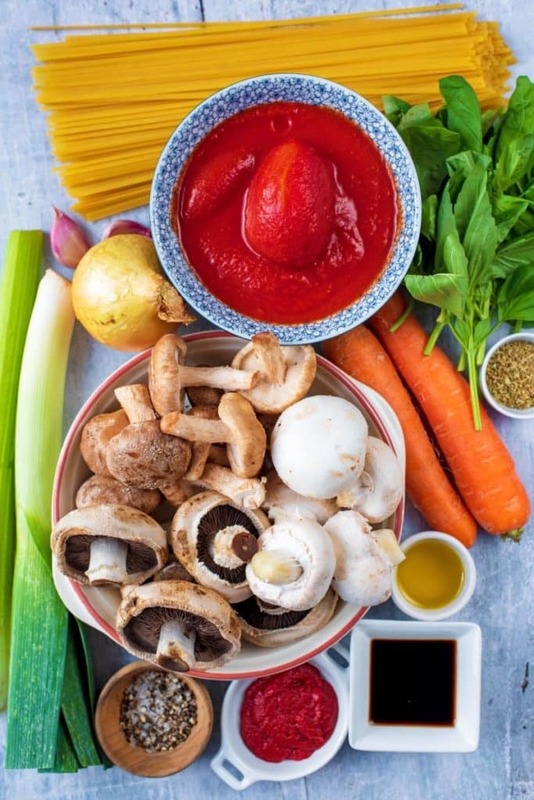 Swapping meaty dishes for vegetarian versions a few times a week can have a huge impact on your health (and environment) and because mushrooms have a real meaty texture, you won’t notice the difference. We have taken a classic Italian dish and given it a vegetarian twist that even meat eaters will love. The key to making a really good mushroom bolognese is using a selection of different mushrooms for plenty of texture. We went with a mixture of chestnut, shiitake, oyster and button mushrooms, but you can use any that you have available. 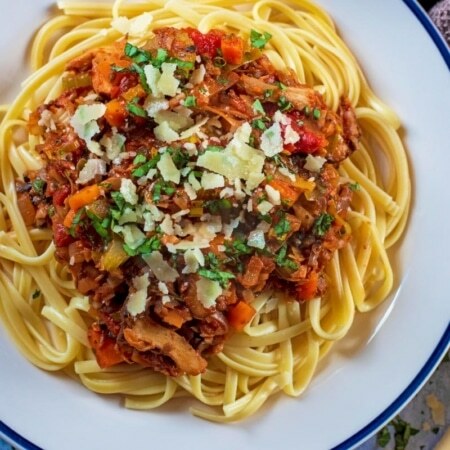 There are lots of way to make a vegetarian bolognese, such as using a soya mince substitute, or using lentils, but using mushrooms is our favourite way because they have such a meaty texture. Mushrooms are always our go-to when trying to eat more meat free meals. You really won’t miss the meat in this, as there is so much flavour from the tomatoes, herbs and vegetables and of course a sprinkling of cheese on top goes a long way! Ragu is traditional a meat based dish that is rich in flavour, and we have recreated that using mushrooms instead of meat. It still has the onion, celery and carrot base, but more tomatoes to add some extra flavour. As well as using lots of different mushrooms to add different textures, we like to cut them different ways too. Some of the mushrooms are finely diced, others are sliced, some in chunks and others shredded. It gives the mushroom ragu a wonderful mix of textures, making this a hearty and comforting dish. The great thing about this mushroom bolognese is that it vegan. Cheese is kind of a must when it comes it pasta dishes, but you can get some great vegan cheese now, so pile some of that on top. If you don’t want to stand over a hob watching this bubble away, then you can put it all in the slow cooker at 4. Cook it on high for about 2 hours and it will let the sauce good low and slow and really intensify the flavour. You just need to then cook the spaghetti when you are ready to eat. One: Add the pasta to a pan of boiled water and simmer for 12 minutes. Two: Put the oil in a pan and heat gently. Fry the onions, carrots, celery, garlic and leek and gently cook for 4-5 minutes. Four: Add the chopped tomatoes, salt and pepper, tomato puree, balsamic vinegar, oregano and fresh basil and stir well. Five: Simmer for 5 minutes (10 is best, but it is cooked after 5). Six: Serve on top of drained pasta. To give this dish plenty of texture, use as many different mushrooms as you can find. We used chestnut, button, shittake and oyster. Chop all the mushrooms different ways to add more texture. We chopped, shredded and left the little ones whole. You could add some extra protein to this dish by adding some lentils when you put the tomatoes in. 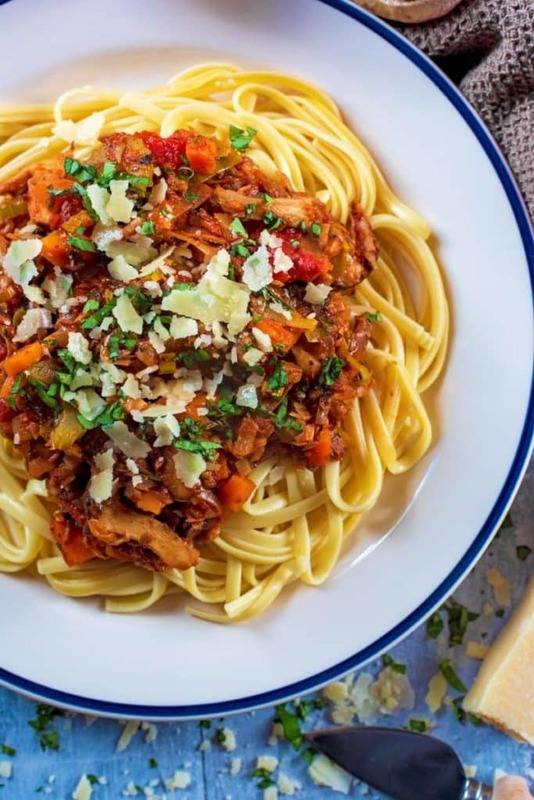 Do you want to be kept up to date on more delicious posts like this Mushroom Bolognese? Please subscribe to the blog mailing list (it takes 30 seconds). 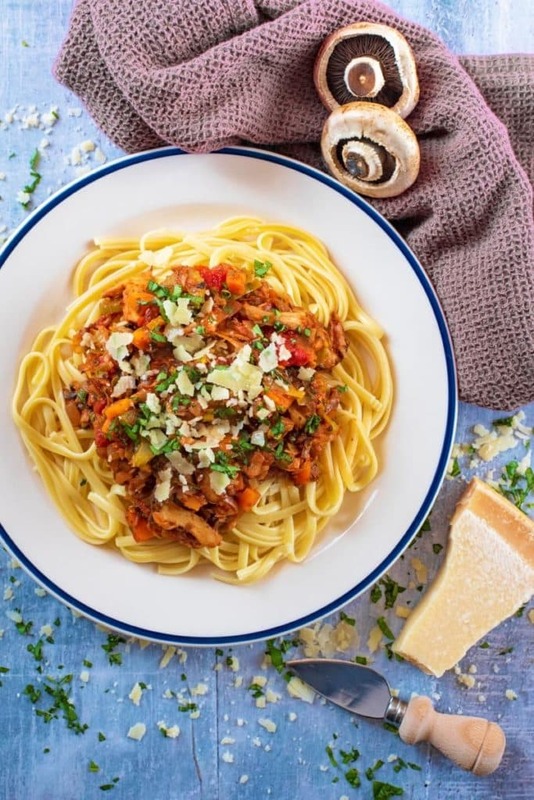 If you’ve tried this Mushroom Bolognese, or any other recipe on the blog, then let us know how you got on in the comments below, we love hearing from you! You can also FOLLOW US on FACEBOOK, TWITTER, INSTAGRAM and PINTEREST to see more delicious recipe ideas, behind the scenes shots and also what we are getting up to. 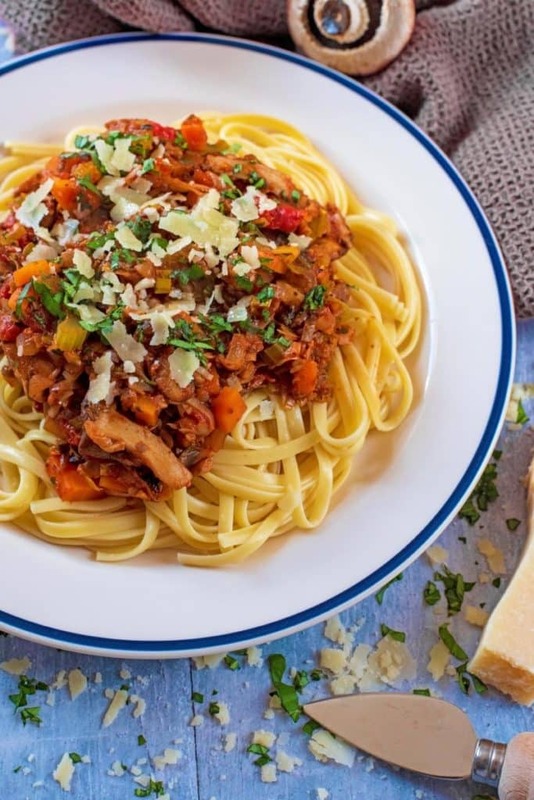 Spaghetti Bolognese is always a family favourite, but this mushroom bolognese is a vegetarian version of the classic Italian dish. Add the pasta to a pan of boiled water and simmer for 12 minutes. Put the oil in a pan and heat gently. Fry the onions, carrots, celery, garlic and leek and gently cook for 4-5 minutes. Add the chopped tomatoes, salt and pepper, tomato puree, balsamic vinegar, oregano and fresh basil and stir well. Simmer for 5 minutes. Drain the pasta and dived between bowls and then spoon the mushroom bolognese on top. Serve with a sprinkling of parmesan and extra basil. Yesterday, I tried to make the mushroom bolognese and I absolutely loved it! I think it’s nice to have an alternative for the classic bolognese. The flavour of the mushrooms combined with the tomatoes and the spices is fantastic. Even though there’s no meat in it, it still has a meaty look. It’s a perfect blend between vegetables and herbs. Healthy and not difficult to make, the perfect pasta in my opinion. I’ll definitely make it again, but can I use ravioli instead of spaghetti? Thank you for introducing me to this recipe! 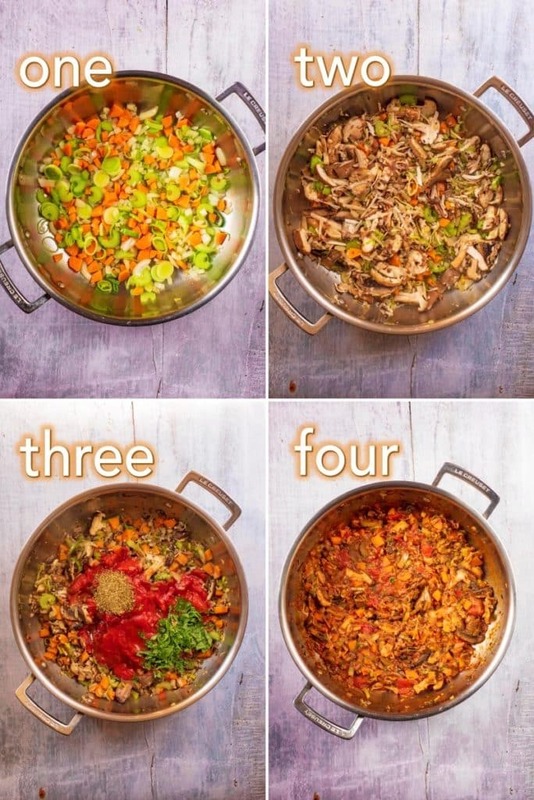 Love this vegetarian pasta recipe! Looks so delicious! This sauce actually manages to look “meaty”! 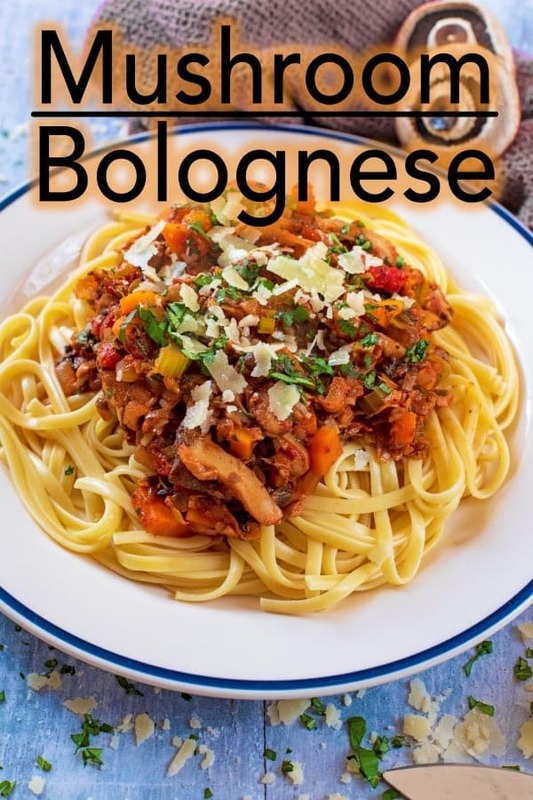 I’ve not tried a vegetarian bolognese so I will have to give it a go! I LOVE Italian food. This Mushroom Bolognese looks super easy and full of ingredients my family loves. Looking forward to trying soon. This sounds absolutely delicious and looks meaty but without the meat! I wish my kids would eat mushrooms as I would cook a lot more recipes with them if they did. It really is amazing how much you can do with mushrooms! This dish looks great. This looks like the perfect alternative to the classic bolognese for meatless Mondays. Your pictures really highlight your dish well. That’s a beautiful bowl of pasta! So much flavor. Perfect for pasta night. I am definitely going to have to make this. I love all of the amazing flavors! And having slow cooker option is so nice for busy days! I am a huge fan of mushrooms and Italian food. These recipe is the perfect blend of veggies and spices. Previously, I never tried it, but with these mushrooms it seems to me that it is very tasty! Good idea for lunch or dinner. I think this will be one of my favorites. Yes, this is the perfect recipe for me. Thank you!